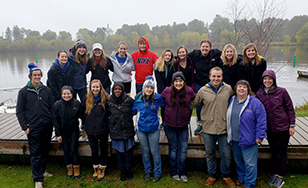 St. Scholastica's day of service will return for the spring semester on Wednesday, Feb. 27. Students, faculty and staff will have the day off to work on volunteer projects in the community. Activities will include reading to elementary school children, cleaning and organization projects at local agencies, and assisting with meal prep at the Salvation Army. A large contingent of students organized by the Student Senate will travel to St. Paul to meet with state legislators and advocate for the Minnesota State Grant program, which helps low-income students be able to attend Minnesota's private and public colleges and universities. Up to 750 members of the St. Scholastica community are expected to take part in the day's volunteer activities.